Objective: To determine whether diffusion tensor imaging (DTI) can detect structural changes in normal-appearing white matter, and to distinguish between plaques of different pathologic severity, in patients with MS.
Background: Conventional MRI detects lesions sensitively in MS but has limited pathologic specificity. The diffusion of water molecules in brain tissue, most fully expressed mathematically by a tensor quantity, reflects its intrinsic microstructure. It is now possible to estimate the diffusion tensor noninvasively in the human brain using MR DTI. This method is unique in providing precise and rotationally invariant measurements of the amount and directional bias (anisotropy) of diffusion in white matter tracts relating to tissue integrity and orientation. Methods: DTI was performed in six patients with MS and in six age-matched control subjects. Diffusion was characterized in normal-appearing white matter in both groups, and in lesions of different pathologic subtypes (inflammatory, noninflammatory, T1 hypointense, and T1 isointense). Results: DTI identified significantly altered water diffusion properties in the normal-appearing white matter of patients compared with control subjects (p < 0.001), and distinguished between lesion types. The highest diffusion was seen in destructive (T1 hypointense) lesions, whereas the greatest change in anisotropy was found in inflammatory (gadolinium-enhancing) lesions. Conclusions: DTI detects diffuse abnormalities in the normal-appearing white matter of MS patients, and the findings in lesions appear to relate to pathologic severity. Its use in serial studies and in larger clinical cohorts may increase our understanding of pathogenetic mechanisms of reversible and persistent disability. Conventional MRI detects signal abnormalities in MS with exquisite sensitivity,1 but standard T2-weighted MRI abnormalities lack pathologic specificity and correlate poorly with disability.2 Other MRI techniques show promise in detecting more clinically relevant pathologic changes. There is evidence that magnetization transfer imaging is sensitive to demyelination or axonal loss,3 that proton MRS of brain N-acetylaspartate (NAA) reflects axonal loss or dysfunction,4 and that T1 hypointense lesions (black holes) represent destructive lesions containing substantial axonal loss.5 Although these techniques show stronger correlations with disability than conventional MRI, underlining the importance of axonal loss and persistent demyelination, there remains a need for new MRI techniques to detect sensitively the structural changes that underpin persistent clinical deficit. Molecules in fluid systems are subject to continuous random motion (diffusion). A water molecule in a glass vessel moves randomly by interacting with other water molecules. The distance it has traveled at a given moment is related mathematically to the time we make the observation by the diffusion coefficient, which describes the rate of diffusion. Water molecules in the brain encounter structures that impede their continued motion in a particular direction. These structures include the myelin sheath, axonal membranes, and subcellular organelles. In this case the diffusion coefficient is reduced, and is referred to as the apparent diffusion coefficient (ADC). MR images can be sensitized to diffusion by means of large magnetic field gradient pulses, allowing noninvasive estimation of the ADC.6 Disruption of the permeability or geometry of structural barriers by pathology alters the diffusion behavior of water molecules. Thus, characterizing diffusion in the brain provides a new technique with which to investigate the effects of disease processes on tissue microstructure. Some biological tissues, including brain white matter, contain oriented barriers to diffusion. This property is termed anisotropy, and results in a variation in the measured diffusion with tissue direction.7 White matter fiber tracts consist of collections of similarly aligned myelinated axonal cylinders. Diffusion is much greater along than across these axons, probably due to directional structures including the myelin sheath, axonal membrane, and neurofilamentous cytoskeleton.8 This directionality of water diffusion causes fiber tracts to exhibit anisotropic diffusion. Anisotropy is of interest because it should be affected by pathologic damage to white matter tracts in MS; for example, by demyelination or axonal loss. Accurate quantification of diffusion anisotropy requires complete characterization of molecular motion in three dimensions. The most complete description is provided by a mathematical quantity (a nine-element matrix)9—the diffusion tensor. Estimation of the diffusion tensor is technically demanding and requires rapid imaging with at least six diffusion-encoding gradient directions. With the advent of echo planar MRI it is now possible to calculate the diffusion tensor in a practical time frame for clinical studies. From the diffusion tensor, measures of both the amount and directional bias (anisotropy) of diffusion throughout the brain may be derived.10,11 In addition to the accurate quantification of diffusion anisotropy,12 an additional, important advantage of diffusion tensor imaging (DTI) is that the quantities derived from it are rotationally invariant; that is, the same measurements for a particular brain structure will be obtained regardless of patient orientation (this may be true under some circumstances for diffusion measurements derived from three-axis data, but this cannot be assumed). Because DTI is able to characterize the microstructural organization of brain tissue in a way that is not possible with existing MRI techniques, it should be able to 1) identify subtle changes in the structure of NAWM and 2) distinguish between lesions of different pathologic severity and at different stages of evolution (e.g., between acute inflammatory [enhancing] lesions and chronic noninflammatory [nonenhancing] lesions). We tested this hypothesis by performing a systematic DTI study of NAWM and lesions (acute and chronic, T1 hypointense and T1 isointense) in MS patients, and in the white matter of normal control subjects. The properties measured were mean diffusivity (MD; a measure of the amount of diffusion) and fractional anisotropy (FA; a measure of diffusion anisotropy). This study investigated the relative sensitivity of MD and FA in the differentiation of lesion subtypes and of patient NAWM from control white matter, and also the relationship between MD and FA to ascertain whether they provide independent or complementary structural information. It was hypothesized that pathologic changes in NAWM (whether predominantly axonal loss or gliosis), and in lesions (due to demyelination and/or other pathologies) should reduce anisotropy compared with control and patient white matter respectively due to a reduction of the structural coherence of fiber tracts. Increases in diffusion in NAWM and plaques compared with control and patient white matter respectively were anticipated, in line with previous studies. Larger abnormalities were predicted to be found in acute inflammatory lesions rather than chronic lesions due to the presence of extracellular edema, and in T1 hypointense than T1 isointense lesions due to a greater degree of axonal loss. Six patients (mean age, 34.2 ± 4.2 years; one man, five women) with clinically definite MS (ascertained using the criteria of Poser et al.15) attending the National Hospital for Neurology and Neurosurgery, London, were studied. A full neurologic history and examination was performed, and disability was assessed using Kurtzke’s Expanded Disability Status Scale (EDSS).16 Five patients had relapsing–remitting MS and one patient had secondary progressive MS. Six normal, healthy matched control subjects (mean age, 34.3 ± 8.9 years; one man, five women) were also studied. All scans were performed on a 1.5-T Signa Horizon Echospeed scanner (Signa, General Electric Medical Systems, Milwaukee, WI) equipped with shielded magnetic field gradients of up to 22 mT m-1 and a standard quadrature head coil for radio frequency transmission and reception of the NMR signal. Head motion was minimized with foam pad immobilization as provided by the manufacturer. The field of view was 24 × 24 cm. High-resolution mildly and heavily T2-weighted images were acquired at 26 contiguous 5-mm axial slices covering the whole brain (repetition time [TR], 2,000 msec; echo time [TE], 30 msec, 120 msec; matrix, 256 × 256), followed by diffusion-weighted echo planar images with no repositioning (TE, 78 msec; matrix, 96 × 96). Diffusion gradients at 4 b values increasing from approximately 0 to 700 sec/mm2 were applied in each of seven noncolinear directions) at 10 slice locations centered on the lateral ventricles and matched to the T2-weighted image slices. Five acquisitions of each set of diffusion data were performed and co-added following magnitude reconstruction to improve the signal-to-noise ratio (SNR). Cardiac gating was used; image acquisition was triggered from every second R wave monitored using a pulse oximeter. The diffusion tensor, MD, and FA were calculated on a pixel-by-pixel basis as described by Basser et al.9,10 (FA was chosen because it provided excellent contrast between white matter tracts and cortical gray matter. Although FA is affected by the amount of noise in diffusion data, particularly at a low SNR, the high SNR achieved in our study by multiple averaging provided FA maps with similar gray/white matter contrast to that obtained using the volume ratio, which is less affected by noise at low SNR.) After DTI, T1-weighted images were acquired (TR, 540 msec; TE, 20 msec; matrix, 256 × 256) 5 minutes after the administration of 0.1 mmol/kg gadolinium-diethylenetriamine pentaacetic acid (DTPA). All images were displayed on a Sun workstation (Sun Microsystems, Mountain View, CA). Lesions were outlined on the T2-weighted images using a semi-automated contouring technique (DispImage version 4.7; D. Plummer, UCL Hospitals Trust, London, UK). Each lesion was first classified as enhancing or nonenhancing and then the nonenhancing lesions were classified (using the postcontrast T1-weighted images) as T1 isointense or hypointense. T1 hypointensity was defined as reduced lesion signal intensity with respect to the surrounding NAWM. Rectangular NAWM regions of interest (ROIs) of uniform size were defined in similar anatomic areas to the lesions (frontal, parietal, temporal, and occipital white matter) on the T2-weighted images. To allow the accurate transfer of ROIs between the T2-weighted images and the quantitative DTI maps, the latter were interpolated up to the same matrix size as the T2-weighted images. For each ROI, MD and FA were measured. The accuracy of mapping was confirmed by correct registration of the outlined brain and ventricles between the two sets of images (T2-weighted and DTI) for each patient. The MD and FA values for each set of regions (control NAWM, patient NAWM, nonenhancing lesions, enhancing lesions, T1 hypointensities) were compared using the Mann–Whitney U test. The relationship between MD and FA was assessed by determining Spearman’s correlation coefficient. The median EDSS score of the patients was 3.9 (range, 1.0 to 7.0); the median disease duration was 3.5 years (range, 1.0 to 17.0 years). The following numbers of regions were studied: 261 NAWM in control subjects, 206 NAWM in patients, 270 lesions of which 25 were enhancing. Of the remaining 245 lesions, 15 were T1 hypointense and 230 were T1 isointense. Some lesions were seen clearly on both MD and FA maps, particularly those that enhanced. An example of a conspicuous enhancing lesion is shown in figure 1. Figure 1. 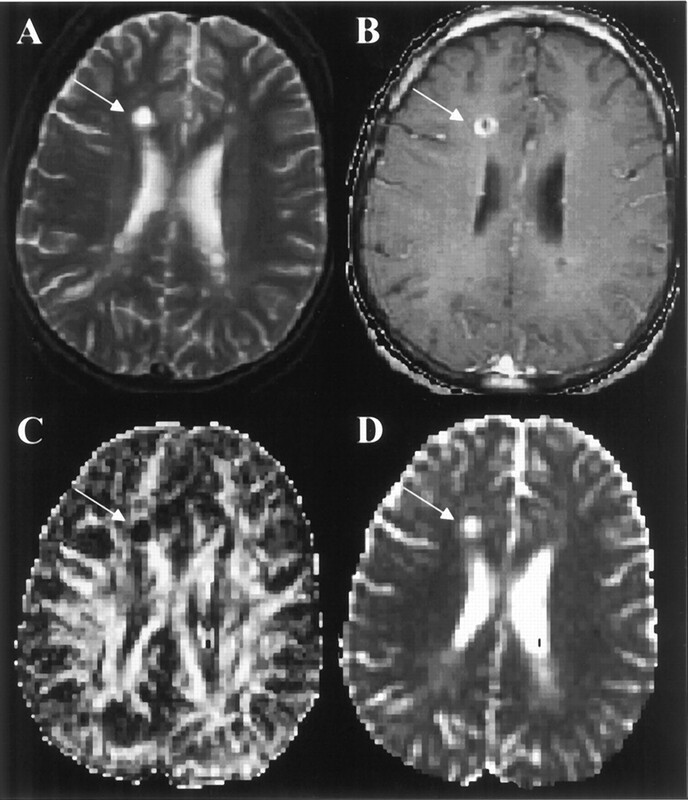 Images acquired of an axial brain slice in a patient with MS. A lesion is present in the right frontal region (arrow). (A) A conventional T2-weighted scan shows a typical area of high signal. (B) A postcontrast T1-weighted scan shows ring enhancement. (C) A map derived from diffusion tensor imaging of calculated fractional anisotropy (FA), a measure of the directionality of water diffusion, at each voxel. Intact white matter tracts show greater diffusion along them than across them, and therefore have high FA (bright voxels). Disruption of tissue integrity causes a loss of FA in the lesion (dark voxels, arrow). (D) A diffusion tensor map of mean diffusivity (MD)—a measure of the amount of water diffusion. The lesion shows increased MD (bright voxels) compared with surrounding tissue. This may reflect acute edema. The right side of the brain appears to the left side of each panel. The results are summarized in the table and figures 2 and 3⇓. MD was higher (p < 0.001) and FA lower (p < 0.001) in patient NAWM compared with control subject white matter. Lesions had higher MD (p < 0.001) and lower FA (p < 0.001) than NAWM. MD was higher (p = 0.03) and FA lower (p < 0.001) in enhancing than nonenhancing lesions. MD was higher (p = 0.002) and FA lower (p = 0.17; not significant) in T1 hypointense nonenhancing lesions than T1 isointense nonenhancing lesions. There was a modest inverse correlation between MD and FA for all regions studied (Spearman’s correlation coefficient, −0.45; p < 0.001; figure 4). Figure 2. Mean diffusivity (MD) (×10-3 mm2/sec) for different types of lesion. Boxes represent the mean values, horizontal lines represent 95% CIs. Normal-appearing white matter (NAWM) in MS patients has a higher MD than control subject white matter. 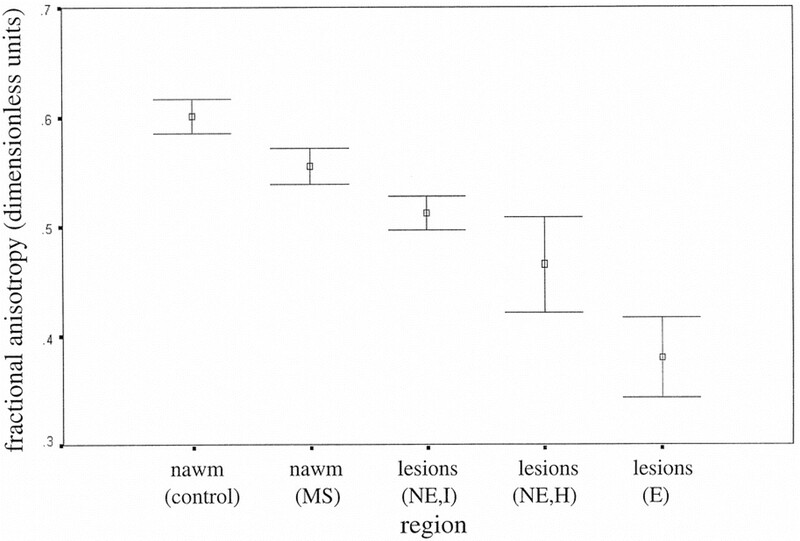 Lesions show higher MD than NAWM (p < 0.001). Destructive T1 hypointense lesions have the highest values. E = enhancing; NE = nonenhancing; I = T1 isointense; H = T1 hypointense. Figure 3. Fractional anisotropy (FA; in dimensionless units) for different types of lesions. Boxes represent the mean values; horizontal lines represent 95% CIs. Normal-appearing white matter (NAWM) in MS patients has lower FA than control subject white matter. Lesions show lower FA than NAWM (p < 0.001). Acute inflammatory (enhancing) lesions show the largest reduction. E = enhancing; NE = nonenhancing; I = T1 isointense; H = T1 hypointense. Figure 4. Scatter plot of fractional anisotropy versus mean diffusivity for all regions studied shows a modest inverse correlation. This suggests that fractional anisotropy and mean diffusivity may provide partially independent and complementary data for evaluating brain structure. Spearman’s correlation coefficient, −0.45; p < 0.001. This study provides new quantitative structural information on the NAWM and lesions in MS patients. The complete diffusion tensor was calculated to provide rotationally invariant diffusion information, including precise quantification of diffusion anisotropy. The diffusion characteristics in NAWM and lesions with different degrees of pathologic severity and acute inflammatory activity were measured. In this study patient NAWM showed significantly higher MD and lower FA than control subject white matter. Structural abnormalities in NAWM may play an important role in the development of irreversible disability in MS. Previous work14,17 has demonstrated that diffusion is higher in NAWM of MS patients than in control subjects, in agreement with our data. At present we can only speculate on the structural substrate of our findings. Studies of NAA concentrations using NMR spectroscopy suggest that axonal loss occurs in the NAWM of MS patients,4 and that this may underlie persistent disability.18 The expected diffusion changes due to axonal loss have already been mentioned; namely, increased MD and reduced FA. Our findings are therefore consistent with the major diffuse NAWM pathology being axonal loss. An advantage of DTI over spectroscopy is that it is possible to map abnormalities with greater spatial resolution; the relatively smaller range of values in the healthy brain for MD may make this the preferred measurement in such studies. In one of the few histopathologic studies of MS NAWM, a high prevalence of gliosis was reported,19 but this would be expected to reduce both anisotropy (assuming that glial proliferation is a rather structurally disorganized process) and diffusivity. Mean diffusivity findings in lesions. Our finding of raised MD in lesions compared with NAWM is consistent with previous studies showing an increased lesion ADC,13,14 and suggests a net loss of structural barriers to water molecular motion in plaques. We also observed higher MD in acute (enhancing) versus chronic (nonenhancing) lesions. Postmortem studies have confirmed that lesion enhancement reflects inflammation, blood–brain barrier leakage, and edema.20,21 There is also evidence that axonal loss can occur in acute lesions.22 Our findings could thus be explained by an expansion of the extracellular space due to a combination of vasogenic edema and axonal loss in such lesions. In the population of acute lesions studied, the effects of these processes outweigh those of others that could potentially restrict water molecular motion, such as the accumulation of inflammatory cells including macrophages and the presence of myelin breakdown products.23,24 There is evidence from proton NMR spectroscopy that acute MS lesions contain lipid products of myelin breakdown.25 Further work combining diffusion MRI with proton NMR spectroscopy may help to clarify the effect of these products on water diffusion. We found a larger range of MD values in chronic (nonenhancing) plaques, suggesting considerable pathologic heterogeneity. Possible contributory processes include gliosis, which has been suggested to reduce diffusion,14 and persisting demyelination, or axonal loss, both of which would be expected to increase diffusion by increasing the extracellular space.26 We observed the highest MD values in T1 hypointense plaques, which probably represent destructive lesions containing extensive axonal loss.5 Our data are consistent with those obtained from a navigated spin-echo diffusion study27 that also reported that T1 hypointense lesions exhibit higher diffusion values than T1 isointense lesions. In this regard, MD appears to give complementary information to T1-weighted images, with the advantage that it is inherently quantitative. Quantitative data on the anisotropy properties of lesions in MS have not been described previously. This study shows that lesions (considered together) have significantly lower FA than NAWM, and that acute (enhancing) lesions have significantly lower FA than chronic (nonenhancing) lesions. Moreover, FA proved more sensitive in discriminating between acute and chronic lesions than MD, as judged by the magnitude and significance of the observed differences. A study of the animal model experimental allergic encephalomyelitis (EAE) using DWI acquired with diffusion sensitization in three directions demonstrated lower anisotropy in acute compared with chronic lesions,28 in keeping with our data. The FA differences in enhancing and nonenhancing lesions could at least be accounted for partly by acute vasogenic edema. T1 hypointense lesions had lower FA than T1 isointense lesions, as anticipated from the greater degree of presumed axonal loss. The lowest FA was seen in acute enhancing lesions, suggesting that extracellular edema too has a marked effect on tissue FA. It will be of interest to measure FA as lesions evolve to determine how much of the structural loss is permanent. Changes due to edema should be reversible, whereas axonal loss may cause a persistent reduction in FA. Future questions for DTI in MS. It is likely that a complex interaction between the pathologic features of MS plaques—edema, demyelination, axonal loss, and gliosis—determines diffusion measurements. The data presented suggest that of these, edema and axonal loss contribute most to water diffusion changes because enhancement and T1 hypointensity are associated with the most significant diffusion changes in FA and MD respectively. Ideally, experimental and postmortem studies correlating the DTI changes and histopathology in MS are needed to establish the pathologic basis of the diffusion MRI findings. DTI is likely to illuminate further the pathophysiologic changes occurring within MS lesions, particularly when employed in longitudinal studies of lesion evolution together with other MRI techniques including NAA spectroscopy and magnetization transfer imaging. That the correlation observed between FA and MD for all regions studied was modest (see figure 3) implies that they may provide partially independent and complementary data for evaluating brain pathology. Measurement of both diffusivity and anisotropy may improve the ability to detect specific pathologic changes, and warrants further investigation. The relatively small number of patients in this study is offset by the large number of lesions and NAWM regions examined, allowing a systematic characterization of their structural properties. However, our sample size does not permit an investigation of the relationship of DTI changes with the clinical course or level of disability. Future studies will examine the relationship of DTI changes to clinical deficit, and the natural history of diffusion changes within lesions. Supported by a generous grant from the MS Society of Great Britain and Northern Ireland. D.J.W. is supported by the Barnwood House Trust. The authors thank Mr. D.G. MacManus and Miss Elizabeth Gunn for technical assistance with the MR scans, and Dr. J. Foong for providing some of the control data. Young IR, Hall AS, Pallis CA, Legg NJ, Bydder GM, Steiner RE. Nuclear magnetic resonance imaging of the brain in multiple sclerosis. Lancet 1981;2 (8255):1063–1066. Paty DW, Li DK. UBC MS/MRI Study Group, IFNB Multiple Sclerosis Study Group. Interferon beta-1b is effective in relapsing–remitting multiple sclerosis. II. MRI analysis results of a multicenter, randomized, double-blind, placebo-controlled trial. Neurology 1993;43:662–667. Gass A, Barker GJ, Kidd D, et al. Correlation of magnetization transfer ratio with clinical disability in multiple sclerosis. Ann Neurol 1994;36:62–67. Davie CA, Barker GJ, Webb S, et al. Persistent functional deficit in multiple sclerosis and autosomal dominant cerebellar ataxia is associated with axonal loss. Brain 1995;118:1583–1592. van Walderveen , Kamphorst W, Scheltens P, et al. Histopathologic correlate of hypointense lesions on T1-weighted spin-echo MRI in multiple sclerosis. Neurology 1998;50:1282–1288. LeBihan D, Breton E. Imagerie de diffusion in vivo par resonance magnetique nucleaire. C R Acad Sci Paris 1985;301:1109–1112. Doran M, Hajnal JV, Van Bruggen N. Normal and abnormal white matter tracts shown by MR imaging using directional diffusion weighted sequences. J Comput Assist Tomogr 1990;14:865–873. Beaulieu C, Allen PS. Determinants of anisotropic water diffusion in nerves. Magn Reson Med 1994;31:394–400. Basser PJ, Mattiello J, LeBihan D. Estimation of the effective self-diffusion tensor from the NMR spin echo. J Magn Reson B 1994;103:247–254. Basser PJ, Pierpaoli C. Microstructural and physiological features of tissues elucidated by quantitative diffusion tensor MRI. J Magn Reson B 1996;111:209–219. Pierpaoli C, Jezzard P, Basser P, Barnett A, Di Chiro G. Diffusion tensor MR imaging of the human brain. Radiology 1996;201:637–648. Pierpaoli C, Basser PJ. Toward a quantitative assessment of diffusion anisotropy. Magn Reson Med 1996;36:893–906. Larsson HB, Thomsen C, Frederiksen J, Stubgaard M, Henriksen O. In vivo magnetic resonance diffusion measurement in the brain of patients with multiple sclerosis. Magn Reson Imaging 1992;10 (1):7–12. Christiansen P, Gideon P, Thomsen M, et al. Increased water self-diffusion in chronic plaques and in apparently normal white matter in patients with multiple sclerosis. Acta Neurol Scand 1993;87:195–199. Poser CM, Paty DW, Scheinber L, et al. New diagnostic criteria for multiple sclerosis : guidelines for research protocols. Ann Neurol 1983;13:227–231. Kurtzke JF. Rating neurologic impairment in multiple sclerosis : an expanded disability status scale (EDSS). Neurology 1983;33:1444–1452. Horsfield MA, Lai M, Webb SL, et al. Apparent diffusion coefficients in benign and secondary progressive multiple sclerosis by nuclear magnetic resonance. Magn Reson Med 1996;36:393–400. Fu L, Mathews PM, De Stefano N, et al. Imaging axonal damage of normal-appearing white matter in multiple sclerosis. Brain 1998;121:101–103. Allen I, McKeown S. A histological, histochemical and biochemical study of the macroscopically normal white matter in multiple sclerosis. J Neurol Sci 1979;41:81–91. Bruck W, Bitsch A, Kolenda H, Bruck Y, Stiefel M, Lassman H. Inflammatory central nervous system demyelination : correlation of magnetic resonance imaging findings with lesion pathology. Ann Neurol 1997;42:783–793. Trapp BD, Peterson J, Ransohof RM, Rudick R, Mork S, Bo L. Axonal transection in the lesions of multiple sclerosis. N Engl J Med 1998;388:278–285. Graham GD, Zhong J, Guarnaccia JB. Echo-planar imaging ofwater diffusion and diffusion anisotropy within multiple sclerosis plaques. Proceedings of the International Society for Magnetic Resonance in Medicine 1995;1:278. Abstract. Gass A, Gaa J, Schreiber ,et al. 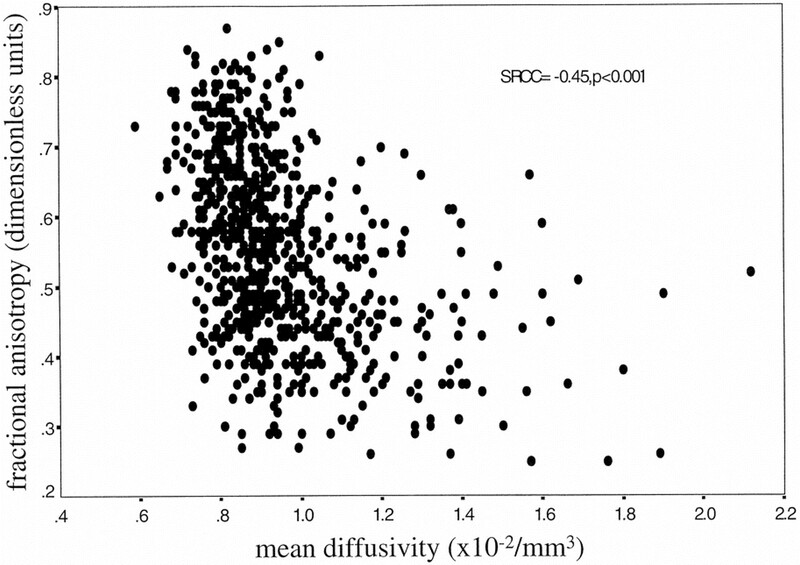 Assessment of the apparent diffusion coefficient in contrast-enhancing and chronic lesions. Proc ISMRM 1998;2:1328. Abstract. Davie CA, Barker GJ, Thompson AJ, Tofts PS, McDonald WI, Miller DH. 1H magnetic resonance spectroscopy of chronic cerebral white matter lesions and normal-appearing white matter in multiple sclerosis. J Neurol Neurosurg Psychiatry 1997;63:736–742. Barnes D, Munro PMG, Youl BD, Prineas W, McDonald WI. The longstanding MS lesion : a quantitative MRI and electron microscopy study. Brain 1991;114:1271–1280. Droogan AG, Clark CA, Franconi F, et al. Comparison of echoplanar and navigated spin echo diffusion-weighted imaging techniques used to detect multiple sclerosis lesions. Proc ISMRM 1997;3:1714. Abstract. Verhoye MR, Gravenmade EJ, Raman ER, Van Reempts J, Van der Linden A. In vivo noninvasive determination of abnormal water diffusion in the rat brain studied in an animal model for multiple sclerosis by diffusion-weighted NMR imaging. Magn Reson Imaging 1996;14:521–532.